Whilst market conditions continued to be challenging in 2017 as predicted, there were signs of recovery partly led by the oil price, with four major FPSO-based developments achieving a final investment decision. Therefore, we look ahead with cautious optimism, although mindful that our industry will continue to be tested on its path to operate economically. Much has been achieved to date, in particular improvements to make deep water more competitive with break-even prices significantly reduced, increasing confidence in today’s climate. 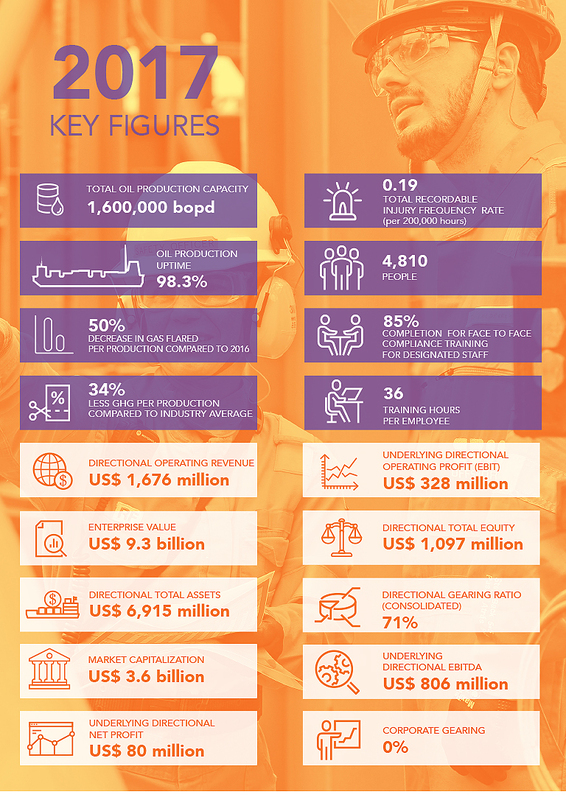 SBM Offshore continued to deliver strong operational and financial performance in 2017. Our strategy has yielded orders for the Lease and Operate and Turnkey sectors of our business. Mid-year, we secured one of the market’s four large FPSO awards with the Liza project and at year-end we were awarded the Johan Castberg turret, underlining our position as an experienced contractor. Our lease fleet enjoyed uptime of 98.3% and achieved record levels of production above 1 million boepd, cementing SBM Offshore’s position as one of the largest operators of deep water production globally. Performance from our Lease & Operate business coupled with a solid close out of projects in the Turnkey business enabled us to deliver underlying EBITDA ahead of expectation. We seek to maximize the operating cashflow from our business to pay shareholder returns and fund future growth, such as the construction of FPSOs. Based on a solid cashflow performance in 2017 and our backlog of US$ 16.8 billion, we are proposing at the Annual General Meeting to pay out a dividend of US$ 0.25. Our efforts on safety leadership and culture led to improved health and safety performance, in particular from the fleet. Environmental performance also showed progress year-on-year, demonstrated by the final implementation of a pilot project on one of our FPSOs as part of our CO2 Challenge to reduce emissions, with overall flaring on SBM Offshore’s account achieving the set target. This project among others has contributed to SBM Offshore’s inclusion in the Dow Jones Sustainability Index for the eighth year running and the Company received ‘Silver Class‘. While the energy sector is witnessing great change − from new supply sources to growing environmental pressures and ever-increasing energy demand − oil and gas are predicted to continue to fulfill at least half of the world’s growing energy demand for the coming 20 years. As we emerge from one of the longest down cycles in terms of upstream investment in the history of our industry over the past 30 years, we anticipate that our clients will make significant investments to satisfy this new demand and replace depleting reserves. The dilemma is the mixed sentiment associated with deep water developments. Of discovered global oil reserves, those in deep water represent around 11% of the total. This makes them a critical element for meeting the world energy demand, especially given the low success rate in finding new conventional oil reserves over the last decade. Why has deep water development somewhat diminished in appeal? Two key elements are at play: the economic development of unconventional reserves such as shale and the lack of reliability in the delivery of deep water projects. The latter led to high costs, which was less visible in the period when the oil price was rising. For example since 2009, 50 FPSOs have been delivered with on average an 11-month delay, costing the industry a staggering US$ 30 billion in value1. This is one of the consequences of using in-experienced contractors. The development of profitable unconventional reserves introduced a new dynamic by significantly speeding up the time to market of oil production from the initial investment decision. It has also probably set a ceiling on the oil price for the foreseeable future and provoked the mantra ‘lower for longer’. The future FPSO market size will depend in part on the next development successes. Effectively delivering deep water reservoirs with an average cost at or below US$ 45 will open up more opportunities going forward. In the short-term, we expect demand to be an average of seven units per year, basically just over half of what it was during the peak period, 2009 to 2014. Investment in more environmentally friendly energy such as gas or the renewable alternatives is gaining momentum. Despite significant progress, the challenge for their development remains technical and economical, with space constraints on land in increasingly dense urban centers a key factor. Market data points out that offshore wind development is becoming more viable far from the coast due to better wind quality, plenty of available acreage and more acceptable aesthetics due to distance from shore. It is too early to quantify the market potential, however, suffice to say that it is expected to grow significantly over the next decade. For years, SBM Offshore has been preparing to meet today’s challenges by building on innovation and capitalizing on its track record. We consistently invest in technology by leveraging our lifecycle expertise to bring new solutions to the market. We have gained the confidence of our clients by delivering on our promises, supplying 10 FPSOs on time since 2009, consistently beating the industry’s poor performance trend during this period. We have invested in our capacities, providing long-term career opportunities to our employees, while adapting the company structure to market reality. Our strategy builds on our strengths, reinforces clients’ confidence and mirrors the market’s needs by encompassing three pillars: Optimize, Transform and Innovate. By being best in class, we capitalize on our competence and technology solutions for FPSOs across the product lifecycle because fossil fuel will remain a major part of the energy mix for some time to come. We believe that deep water development can be economical even at a low oil price. We continuously strive to optimize the delivery of our existing business portfolio in line with or above the expectations of our clients and other stakeholders. We seek to continually improve our operating performance, in particular our productivity by leveraging our experience and increasing the impact of digital advances. Paramount to make deep water fields economical is short time to first oil, speed to ramp up to maximum production and reliability, which is why we have researched and pursued ways to transform the deep water development market. This year we committed to and actively marketed our game-changing concept Fast4Ward™. We are advancing it by standardizing our design and optimizing our business model. Our decision to proceed with the order for the first Fast4Ward™ hull demonstrates our confidence in this concept. While doing so we are making the market envisage a more predictable future by using our next generation FPSO. By bringing to market innovative ways for our core solutions to overcome today’s challenges and barriers, we are transforming our offering and providing synergies with our existing operations. Progress on our Fast4Ward™ project and digital FPSO concept is re-writing the FPSO story. As part of our holistic view, we use our unique knowledge of the interfaces between the underwater structure and our floating solutions to facilitate further a critical review and optimization of the field architecture. When looking at successful offshore field developments to date, the recurring themes are the upfront choice of experienced contractors, leveraging their expertise to propose a simplified offering and engaging in a real partnership. As an experienced contractor, SBM Offshore makes the difference. We encourage the conversation to move from a perceived cost-base vision to a complete economic view where value creation across the product lifecycle is the focus and cost reduction is an inherent part of the equation. In parallel, the energy mix is shifting and as a solution provider for the energy market as a whole, we are transitioning our core business in-line with this trend. We are innovating to develop our market position as the industry is heading towards a more dominant role for gas and ultimately renewables and in 2017 we put more resources behind this strategy. We aim to capitalize on the expected exponential growth in these energy sources by leveraging our experience, strengths and expertise in these areas. Our value drivers are embedded into our strategy. Take the example of our people whose knowledge and expertise are the industry’s best – SBM Offshore’s reputation rests on their steady shoulders and they uphold our values of integrity, care, entrepreneurship and ownership. Regarding the important issue of compliance, the closure with the U.S. Department of Justice (DoJ) investigation into legacy issues and Unaoil is a significant step in settling our legacy issues. Although, the process to reach a resolution in Brazil remains complex, we continue to cooperate with the local authorities to find an acceptable conclusion for these historical issues. 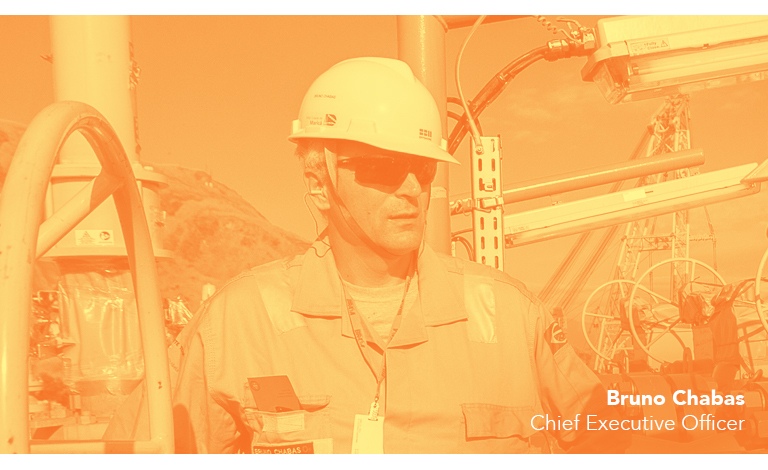 When I took on the role of CEO in 2012, I was determined that SBM Offshore should demonstrate outstanding governance and compliance and as such extensive remedial actions were taken. The Company has fundamentally changed by improving its ways of working, strengthening its policies and controls and changing the business model to operate in an open and transparent manner. Our code of conduct is embedded in each employee’s daily activities and the culture of zero tolerance for non-compliant behaviors is embraced at every level. We are in a strong position for the future. The Company continues to move forward steadily to meet our long-term goals. The contract awards this year demonstrate this and underline that our experience matters in real terms. By staying disciplined in terms of its risk appetite, SBM Offshore remains in control of its future activities, minimizing the risk of surprises later. Our strategy is to target business where SBM Offshore can add value for its stakeholders and differentiate itself. The past years have been challenging for our industry and for SBM Offshore. On behalf of the Company, I would like to thank our shareholders and customers for their constructive support. I would also like to personally thank the SBMers for their dedication, flexibility and efforts during this difficult period. Whatever the short-term market scenario, we look forward to a bright future thanks to the hard work put in to date and the valuable experience gained.